So, you’ve finally found the dress of your dreams! Good job! With one of the biggest decisions made, you may be relieved that you’re done with the most important part of wedding shopping. But, before you sit back and relax, you have a few more tasks to actually complete your wedding dress shopping. Let us look at what they are. It is highly unlikely that the dress you buy will fit you correctly. Alterations are key to obtaining a perfect fit. Check whether the store where you purchased the gown offers fitting services. Else, find a professional seamstress who knows her way around wedding dresses, to do the job. Plan your fitting schedules so that your wedding dress is ready well ahead of the date of the wedding. Now that you’ve chosen your wedding dress, it is time to accessorize. Your first stop should be the shoe shop as it is a good idea to wear your wedding shoes to your first dress fitting session and get the skirt hemmed to the correct length. You will also have to break your wedding shoes in, so they do not pinch or hurt your feet on your wedding day. The earlier you buy your shoes, the sooner you can accomplish this. Once you buy your wedding dress, you should plan what you want to wear with it, to complete your wedding look. For a gown that has plenty of details and embellishments, go with simple jewelry. If you have chosen a simple wedding dress, you can opt for bold and big jewelry pieces. Buy them sooner than later, so you can see how they go with your wedding dress. You will also have time to change them if they do not go together. If you will be using a family heirloom, get it out, have it polished and ready for the day. Apart from jewelry, you’ll also have to get all the other required accessories. 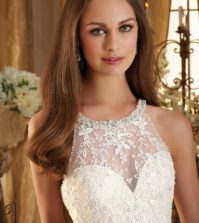 Depending on the look you have planned, go shopping for your tiara, veil, headpiece, clutch or any other accessories you may require to complete your wedding look. Be flexible with your ideas on accessorizing and don’t wait till the last minute to go shopping. Every accessory you choose should work well with your dress, and not against it. Haven’t you found your wedding dress yet? Visit us at Best for Bride to browse through our vast collection and find the choices that are right for you. Great tips! The accessories and the fit are the two most important that you have listed. I didn’t think I was going to get it altered after I bought it, but I think I am going to have to. I guess that is a great way to get a custom fit.